Yesterday’s post got me thinking about the 70’s again. I was married in 1975 and my son was born at the end of that year. 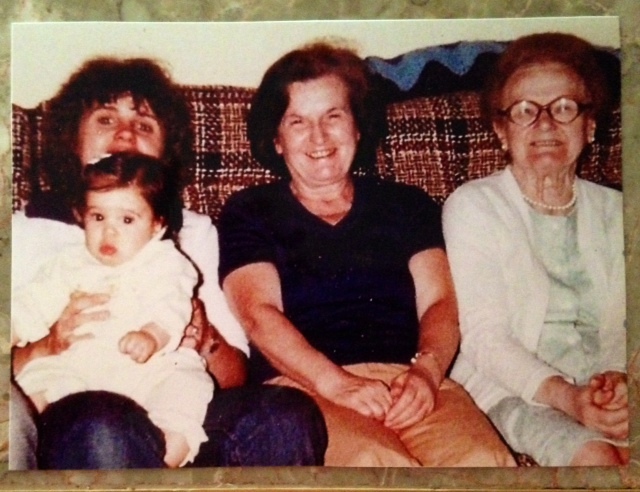 Three years later my daughter came into the world and that’s when we decided to snag this 4 generation picture. This picture is an absolute treasure!! I love it!! Well, I had thought I lost this picture and needless to say I was devastated. As it turned out my daughter had found the picture and gave it to me for my birthday. Wow, a total rush of joy…. You just can’t replace such a precious piece of history. It was taken in 1979, Look at my curly Shirley Temple hair Lol. Pretty cool to take a look back! I enjoyed this bit of nostalgia. Miss you Grandma, you were awesome and so was your cooking :-). Miss you Mom, so many memories… and Sandy; you have grown into a beautiful young woman that I am extremely proud of!!! Well picture thanks for taking me back to a beautiful memory… I have definitely enjoyed it :-). Previous NaBloPoMo day 18 The good old days??? Next NaBloPoMo Day 20 Maggie’s Day dream! My great grandma died when I was still a kid, but not before she had blessed my childhood with the opportunity to explore her three story row home in the city and the pride of her having hung my crayon creations on the wall in her dining room. I remember my grandma used to take walks with me, patiently supervising while I collected white smooth stones and picked bright yellow dandelions. She also had a soft round belly that made the perfect pillow for sleepy heads. Oh, and my mom. How I wish I could sit down over cups of coffee and talk with my mom again. My mom was my best friend and I miss her so much. This picture of yours shows the incredible blessing of family. Thanks for sharing your memories and stirring up mine as well.